Frederick Douglass is one of the most important thinkers in the history of the United States. David W. Blight’s fantastic biography, Frederick Douglass: Prophet of Freedom shows the man in a way I hadn’t met him before, despite reading one of his three (!) autobiographies. I write in this post that he is a prophet for then and now because much of what Douglass had to say can still apply to today. His philosophical insight, his way of speaking, and his life’s devotion to a cause are things we can think on and emulate to this day. Frederick Douglass was born into slavery, took help where he could, taught himself to read and write, and escaped from slavery. He became one of the most traveled people of his century, a prolific speaker, writer, abolitionist, and philosopher. Blight uses the term “prophet” in the way that highlights Douglass’s words to moral persuasion, just as so many of the Old Testament prophets did. And Douglass was a deeply Christian man who saw two faiths that were incompatible co-existing in the United States: the religion of slaveholding and the religion of Christ. Douglass existed in a place where few others did. A former slave, he told firsthand accounts of the brutality of that horrific system and its injustice. Working with white abolitionists, he favored more radical views and even, at times, the perfectionism of some aspects of the abolitionist movement, while also moderating some of his positions depending upon the crowd to which he spoke. An insightful, lucid thinker, he called injustice to account and pointed out the true hypocrisy of people calling themselves Christians while perpetrating awful deeds. One example of the clarity of thought he provided united with his “radical” persuasions about antislavery can be found in his philosophical argument about the morality of the slaveholder and slave: “The morality of a free society can have no application to slave society. Slaveholders have made it almost impossible for the slave to commit any crime, known either to the laws of God or to the laws of man. If he steals, he takes his own; if he kills his master, he imitates only the heroes of the revolution” (quoted on page 57). This kind of sharp logic is revolutionary and world-changing, and many saw it as such. Douglass’s life would be impossible to summarize here. Blight’s biography is one of those which goes for a fairly comprehensive look at the life of its subject. A few notes along the way: Douglass reacted to and changed his view on some things over time. His bootstrap-type thinking for African Americans was moderated in later years as he saw how inequality could be enforced through Jim Crow laws and the like. He married a white woman after his first wife died, causing no small amount of controversy and showing his–and Helen Pitts’s–commitment to the equality of all people regardless of skin color. He leveled vicious attacks on slaveholders and their cruelty but later in life moderated some of these claims, perhaps in order to try to assist with the reunification of a country he saw as died and resurrected after the Civil War. There is no shortage of rich detail to his life. Blight points out how Douglass was, as any would be, prone to shaping his personal narrative to fit current needs. He was also one who enjoyed the spotlight and did not wish to cede it to other rising stars, though he did help mentor many African Americans and was generous with his often overestimated wealth. Though Blight does little reflection on Douglass’s application to our day, the parallels could be drawn out. For one, racism continues to exist to this day. Organizations that are white nationalist, KKK, and the like continue to exist. Less overt racism continues in supposed color-blind laws that are unequally applied. Moreover, the co-existence of true faith–the faith in Christ–with radical heresy and anti-Christian beliefs continues to this day in movements like the Prosperity Gospel. Any Christianity which tears people down rather than freeing them with grace, which divides rather than unites (as in Galatians 3:28) is a Christianity without Christ. Let us allow Douglass to continue to be our prophet of freedom and listen to his words today. Frederick Douglass: Prophet of Freedom is a truly monumental work on the life of a monumental human being. Douglass is a name that every American ought to be familiar with. He was a prophet of our country and one whose words should continue to stir us to fight inequality on every level. Biographies that truly shake and shape the reader are few and far between, but this is one that did so for me. Immigration is an extremely messy issue. Under both Republican and Democratic administrations, “law and order” has been a cover for making the “other” unwanted and “illegal.” Every human being has basic human rights. Those do not need to be earned. Aviva Chomsky’s book, Undocumented: How Immigration Became Illegal provides both historical background to how immigration came to be viewed in such a negative light as it now is as well as arguments for the basic human rights and dignity of all. Chomsky provides historical data to understand how immigration became illegal. This is extremely valuable and important because too often, people just say that their ancestors came to the United States the “right way” and make the assumption the process was similar to what it is today. However, there was very little regulation of immigration whatsoever until racial bias began to lead to quotas for people coming in. The Chinese were some of the earliest people targeted, as exceptions and quotas were made to prevent Chinese from becoming citizens. Mexicans were, historically, another national group that was seen either as non-immigrants (not because they were here illegally–no laws governed such migration until relatively recently–but because it was simply taken as a given Mexicans would not stay in the United States) or as a group to be suppressed in its immigration status. Nationality was used to allow for colorblind laws that would simply restrict immigration on one’s nation. As Chomsky writes, “Once status is inscribed in the law, this becomes an automatic justification for inequality: ‘it’s the law! '” (25). The movement to national exclusion of immigrants allowed racist policies to be enshrined in law. After all, countries are not races. Once race could no longer be allowed to deny citizenship, “nationality stood in for it, and citizens of countries like China lost their right to immigrate” (35). Laws had to be made in order to restrict immigration. Chomsky notes the inequality of movement of people: a United States citizen can, generally, get their passport and unlock travel to virtually any country in the world. Some travel may require a visa with an extra fee, but there aren’t many total restrictions on travel. Contrast this with attempting to enter the United States: here, we have laws that restrict people of other nationalities from entering our country. Similarly, though Chomsky’s book was written before the current administration under President Trump, there have been arguments for and actions banning travel to the United States purely based upon one’s religion. Such restrictions are social, legal constructs that allow the definition of human beings to be tied to national or religious affiliation. Feasibly, this could be expanded almost indefinitely. Thus, immigration law is not an unchanging, immutable thing but rather something that has changed and continues to change. It is mistaken simply to write off the “other” as illegal or even as “other” purely based on laws that have not even been in effect for more than a few decades. Chomsky delves into the questions related to undocumented status and alleged eligibility for various benefits (it is almost certainly more complex than any reader may think). Then, she moves into undocumented status and working. What is of interest is that labor laws that target undocumented immigrants has, in several cases, led to economic hardship. The exploitation of undocumented laborers helps drive the standard of living citizens of the United States have become used to. One example is in agriculture. “Farm work is so marginal, strenuous, and low paid, that if workers achieve legal status, they quickly move to other sectors… True, for many Mexicans… low-wage, temporary, migrant labor in the United States offers a viable or even hopeful alternative to poverty at home. But this merely means that the US agricultural system depends upon the existence of a lot of extremely poor people in Mexico” (127-128). Furthermore, by making migrant workers “illegal,” this allows citizens of the United States to benefit from their low-cost labor while also not having to provide them with any benefits in turn. “Although the current system benefits many people in the United States, we must also recognize its fundamental injustice and think seriously about how it works and what steps could make it more just. If immigrants are being exploited by the current system, and if undocumentedness is one of the concepts that sustains inequality and unjust treatment, then we need to question undocumentedness itself” (150). [W]e have become accustomed to the notion that controlling the border is a basic prerequisite for security, safety, and sovereignty… The entire immigration apparatus is based on the presumption that we know where people belong and we need to legislate their mobility. It’s also based on some unquestioned assumptions about countries. It is not OK for a public park… to discriminate regarding who is allowed to enter its space. But it’s OK for a country to do that… US immigration laws do just that: discriminate, on the basis of nationality, regarding who is allowed to be where. That is, we need to question the very basis for the need for such strong immigration laws rather than accept public assumptions about them. Reform includes a reformation of our minds and thoughts: a questioning of assumptions and looking at facts instead. Since immigration does contribute to our economy in numerous ways (some of which Chomsky documents), we ought to question why there is such a push to restrict it. “In the most immediate terms, we as a society created illegal immigration by making immigration illegal” (208). Is such a move actually something that is necessary? If so, why? These questions need to be answered not by knee-jerk reactions or platitudes such as “a nation without borders is no nation.” After all, nations may still have borders while allowing for immigration. The United States managed to do so all the way until 1882 when immigration laws targeted Chinese people! Undocumented is a book that is worth reading no matter your political persuasion. Neither Democrats nor Republicans have offered a holistic view of personhood that allows us to adequately view the rights of all humans as equal. This is something we ought to address. Particularly for Christians, there is no question that all people are equal and deserving of our protection. Chomsky has provided historical perspective and even a way forward in thinking on this complex issue. Several friends had recently talked about finishing this book and how much they enjoyed it. I also recalled seeing the recent-ish movie several years ago (though, having finished the book, I threw it on hold at the library, so I’ll be watching it again!). Also, there’s a delicious sandwich that I at least assume got its name from this book, which makes it even better. But other than these fleeting glimpses, I knew pretty much nothing about Alexandre Dumas’s The Count of Monte Cristo going in. The memory of the movie had faded, and I just recalled there was some guy who wanted revenge. Yeah, there’s a lot more to the novel than that. The Count of Monte Cristo is, on the surface level, a novel of vindication and revenge. It’s an adventure that spans more than a thousand pages. Yet it remains a page-turner that demands to be devoured in sitting after sitting. But on the deeper level, it is a fantastically Christian look at the world and God’s action therein. The set up for the plot involves the man who would be the count getting set up by several who wish him ill for various reasons. But throughout even that section, “Providence” is constantly in view. Providence is historically one way people talked about divine activity in the world, so the reader is led to see Dumas’s viewpoint as having a divine hand in many acts. And, indeed, as our lead character begins his quest for vindication and vengeance, bringing blessings and curses upon those who helped or hindered him, we as readers cannot help but associate his actions with those of God. We want the Count to succeed in his quest for revenge; it is so well planned, and he has become a man of almost limitless poise and focus. It is not until the count has one part of his vengeance go “too far” that he starts to have second thoughts. These second thoughts translate into an awareness that our Count’s activity is not just the hand of God acting. Though we as readers have been rooting for him throughout, it becomes clearer that the assumptions we’ve made about how the story is going are wrong. It’s as though Dumas played into our expectations, allowing us to think that, perhaps, here is the kind of “divine vending machine” that we so often wish to turn God into. Here, in at least this story, God is working in the way that we want, dispensing a kind of hard justice on wrongdoing and giving great benefit to those who deserve it. But our Count realizes that this is not, in fact, what is happening. His own actions have been, well, his own. Has he been aided by God? Yes, in the sense that his endeavors could not have all succeeded without some acts of Providence. But he has presumed too much. Like Job in the Bible, he has questioned God; nay, he has gone farther and turned himself into the hand of God, dishing out vengeance and blessing as he wished. And his actions have led to a great wrong with the death of innocents. So Dumas asks us to take ourselves back out of the shoes of the Count, to stop assuming that we know what is supposed to happen. Instead, he has lured us into this complacency, thinking we know how things ought to be, when instead we should be approaching the acts of God with fear and trembling, carefully avoiding the notion that we can make God act in the ways we desire. Hidden in plain sight within this apparent adventure novel, we have a serious theological commentary that forces us to re-examine who God is and how God acts. How often we make God into what we want, thinking we can control God! Yet here we see how foolish that is, and how we must once again evaluate the assumptions we have made. So apart from this deep theological discussion, is there a good book? Yes, yes, yes, a thousand times yes. The novel is so well written. I found it un-put-down-able. It’s a true page turner even at its doorstop-like heft. The story is full of beautiful description and overflowing with heart and depth. There is far more that I could say about The Count of Monte Cristo. It’s such a phenomenal achievement. It definitely stands among my favorite works of all time, and I cannot recommend it highly enough to you, dear readers. Let’s get this out of the way: this is not the same “Ben Hur” as was found in the wonderful version acted by Charlton Heston. In many key plot points and even some of the shared ideas, this is a different movie. I am reviewing this as a massive fan of the book (which I read annually) and the 1959 film. I went in with fairly low expectations, particularly regarding the poor early reviews. There will be some SPOILERS in the review that follows. The basics of the plot are that Ben Hur is a Jewish prince whose adopted brother is a Roman, Messala. Messala goes to become a Roman soldier while Judah Ben Hur remains back in Jerusalem. When Messala returns, he wants Judah to help him track down zealot dissidents. Judah refuses, and when one of the dissidents attacks the new Roman governor, Pontius Pilate, Messala takes the whole Hur family into custody, sending Judah to the galleys as a slave. Judah escapes after a battle at sea and with the help of Sheik Ilderim, challenges Messala at a chariot race. He defeats his rival, disabling Messala for life. However, when he sees Jesus crucified and hears him call out forgiveness, Judah realizes his error and returns to Messala to ask for, give, and receive forgiveness. The two reunite and continue to live as brothers going forward. Again, these are the plot basics and I don’t even touch there on the wonderful character of Esther or some of the other sub plots that occur in the film. For those familiar with the other versions, some of these plot points will be surprising. For me as a viewer, it was refreshing to see them not stick 100% to previously told versions. Some of these changes were for the better. Frankly, to show Messala and Judah reunite as brothers (though the adoptive brother spin was a bit much) at the end shows the forgiveness that is so central to the novel in a much better way. However, some of the other changes were more difficult to swallow. For example, excising the story of Judah saving a Roman consul wasn’t necessarily a bad thing–it helps keep the pace going. But it also meant that there was little explanation for just how Judah became such a good chariot racer. Yes, he knew about horses before, but it is clear from the portrayal of conversations with Ilderim that he is a novice at chariot racing. How, then, does he suddenly defeat some of the best in the whole region of Judea? The film answers the question through tutelage from Ilderim, but it could have much more tidily and believably answered it by having Judah and Messala race chariots at the beginning of the film where they are portrayed racing on horseback. If he already knew about racing chariots, it would be much more believable. Small details like this are the main complaints I have with the plot. Overall, I think it did a great job capturing the spirit of the novel. One of the other complaints with the film is the extensive use of CGI in some key scenes. Yes, the naval combat in the 1959 version has some dated elements, but it was awe inspiring to behold. Here, we have what is clearly an extended use of computer graphics rather than the epic way it has been filmed before. The chariot race was still pretty magnificent, but taking out the menacing teeth on Messala’s chariot and, again, using CGI to help flip the chariots around more cheapened it slightly. It was good; but not as good as the earlier version. I liked that Esther had such a prominent role throughout the film, acting as a woman of faith and integrity throughout. Moreover, they showed women in the garden when Jesus was arrested, which almost certainly was the case given the number of female followers Jesus had. I also, as mentioned, enjoyed the strengthening of the Messala-Judah relationship. It helped show the them of forgiveness in a much more intentional way than was otherwise the case. Frankly, it is this last aspect that I enjoyed most about the film- the wise use of various scenes to strengthen the worldview themes of the story in ways that didn’t bog down the film. It was so well-paced that I never felt bored or that something could have or should have been much shorter. Overall, is it as good as the version with Charlton Heston? No. In my opinion, nothing could be that good. It’s my favorite movie ever. Is it worth seeing? Absolutely. It has enough differences to make it interesting, and it is done so smartly that it warrants repeated viewings. As I said I went in with low expectations, and those were lowered by early reviews. However, I enjoyed it quite a bit and felt it was a worthy reimagining of the story. I recommend it highly. Religious Pluralism- A case study from “Ben Hur” by Lew Wallace– The post introducing this entire series on “Ben Hur.” It has links to all the posts in the series. Ben Hur- The Great Christian Epic– I look at the 1959 epic film from a worldview perspective. How does the movie reflect the deeply Christian worldview of the book? All Rights Reserved. Use of any elements of this post subject to approval by the author. Lecrae had a hard life, but makes fulfilling, worldview-rich rap music now. One Sentence Book Reviews- Read more one sentence book reviews here. I’ve decided to do one for every book I read, which is a lot. I got started on 5/14/16 so this list will grow from there. I finally got around to reading the first collection, which has a bunch of Smith’s short stories as well as the novel Norstrilia in it. I gotta say it blew me away. The introduction certainly set me up with high expectations–this unknown author with a pseudonym that made it even harder to determine blew up the science fiction scene when one of his stories was published in a sci-fi magazine some time ago. Well, the stories blew me away too. Here is a collection of stories unified around a central timeline that has breadth and scope that is sometimes hard to comprehend. As a reader, you’re thrown into a world with a huge amount of terminology, names, and histories that are unknown and mostly used unapologetically until you figure out what they mean. It’s a bit like reading Dune the first time (how’s that for a recommendation?). The world Smith created spans thousands and thousands of years, and the stories take you across a portion of that time. Humanity has sought to eliminate sorrow and hardship, but in doing so have created the “Underpeople”–human-like creations made from synthesis with animals. These underpeople basically serve as slaves for the “real people.” Thus, there are some elements of social justice found throughout the stories. There is also a strong sense of dystopia as the way hardship is eliminated is through brainwashing, reconditioning, and the radical loss of human freedom. There are also elements of religion found scattered throughout, with subtle references to Christianity melded into a kind of retelling of Joan of Arc, among other stories. One central theme in the novel that is included in this collection, Norstrilia, is the theme of forgiveness and the power that it can bring in one’s life. All of these elements are set to an amazing lyrical style of writing which weaves poems and songs and even descriptions of artwork into the stories in meaningful ways. Smith’s writing style makes the words seem to flow from the page in a rhythm, even when it is written into paragraph form. Smith’s background in psychological warfare (I’m not making this up, folks) also comes through in a number of–sometimes disturbing–ways. 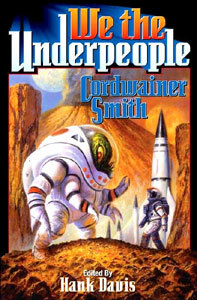 We the Underpeople is an absolutely incredible read that I would recommend to any and all fans of science fiction. The epic scope, beautiful style, and wonderful stories contained herein are well, well worth the price of entry. I’m pleased to say I’ve discovered a master writer I didn’t even know about. Thanks for putting a dragon on the cover of the second book, Baen books! Time to read the next collection. Oxygen by John Olson and Randy Ingermanson is a novel of an attempt by NASA in the near future [originally published in 2001 and set in 2012-2014 it is easy enough to imagine it being in the near future still] attempt to make it to Mars. There will be SPOILERS in what follows. The story is intense from the beginning to the end. A mission to Mars is something that would be stressful no matter what, but the characters set the stage for the suspense early on. The story basically goes from the recruitment of Valkerie [not Valkyrie] for the mission through trying to ensure budget cuts don’t sink it, to launch, some major and nearly catastrophic accidents, and finally to landing on the surface of Mars. All throughout there is an undertone of intensity built up from suspicious of terrorism, sabotage, and more. The book as a whole is intensely character driven, with much of the action taking place alongside lengthy conversations and internal dialogue. However, this never seems to slow the story down or impact the pacing in a negative fashion. The dramatic interactions of the crew members and others is always interesting to read and it all feels intensely “human.” There is something that is just thoroughly real about these characters Olson and Ingermanson have created that makes them entirely believable. The journey of the characters is also worth pursuing as they go from trust to suspicion after an apparent bomb turns the trip to Mars into a race against the loss of oxygen. The way this develops over time is, again, completely believable because of the way the characters have been developed so well. Then, as they pull together towards the end, it is again completely in character. I can’t emphasize enough how much these characters feel like “real” people. There is also plenty of neat near-future science fiction in there too, from what it would be like to try to get funding for NASA to get to Mars–including the politics and media circuses–to the accounts of action surrounding the launch and traveling of the rocket and ship. Alongside all of this there are some quiet undertones of faith and the intersections of Christianity and science. Some people picket the training ground of the Mars mission, arguing that the whole thing was just an attempt to “prove evolution.” The main characters–particularly Bob and Valkerie, have their own perspectives. Bob, a Roman Catholic, takes evolution largely in stride. Valkerie, a “born again” Christian, has struggled quite a bit in her Christian walk. Too often, she argues, people portrayed science as the bane of religion and viewed her training as a scientist with deep skepticism. She almost lost her faith due to this, but was carried through by a deep relational experience with God. The way the authors–each with PhDs in science (Olson = biochemistry and Ingermanson in theoretical physics)–portray these brief but insightful discussions is deeply appreciated. I’m not sure if it is reflective of their own experience, but it certainly is a reflection of mine, and I’m not even a scientist! My own faith has been called into question–and even called apostasy!–simply for not adhering to certain perspectives on creation. Would that more Christians would find themselves called to insightful, genuine dialogue on this topic, like the characters of this book, rather than compelled to shout each other down! For those who’d like to read more on this topic, please check out my other site’s page on the Origins Debate. Overall, Oxygen is a simply fantastic read, all-around. I enjoyed it immensely and recommend it highly to my readers. 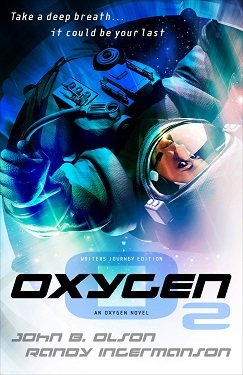 Overall, Oxygen reminds me quite a bit of a Ben Bova novel (a very positive association) with less discussion of the science/universe and more character development. I enjoyed it enormously. J.W. Wartick- Always Have a Reason– Check out my “main site” in which I discuss many topics in theology and philosophy, including the science/faith debate. I love science fiction so that comes up integrated with theology fairly frequently as well. I’d love to have you follow there, too! John Olson and Randy Ingermanson, Oxygen (Colorado Springs, CO: Marcher Lord [Now Enclave] Press, 2011), second edition.